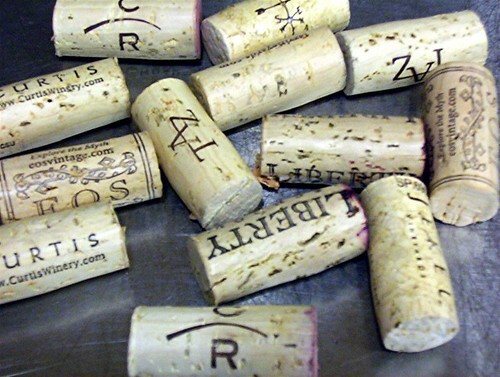 Last week we helped out with a wine tasting that featured moderately priced wines from California’s central coast region, chosen by Tom Saunderson of Young’s Columbia. As usual, it was a great selection – there really was something for everyone. Jekel Vineyards Riesling – I’m not usually a big riesling fan, but this was clean and beautifully balanced. Yummy. Carmel Road Vineyards Pinot Noir – good pinot for a decent price. Eos Vineyards Chardonnay – a big, oaky California chard, but without that syrupy mouthfeel they sometimes get. Good. Liberty School Cabernet Sauvignon – always a favorite. Just a nice big fruity cab. Taz Vineyards Pinot Gris – good, but I’d probably appreciate it more in summer. Curtis Winery Heritage Cuvee, red blend – this was really nice. Great with the steak and onions plate (see below). There was plenty of food at this tasting. The first course was triangles of moist dark rye bread spread with a mixture of cream cheese, gouda, butter, parsley, cilantro, raw garlic, paprika, lemon juice and salt – accompanied by little pastry cups with brie and fig sauce. Fantastic with the riesling. 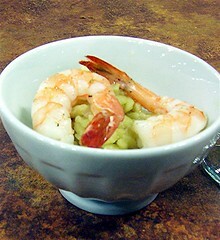 The second course was lemon orzo topped with oven-roasted prawns. 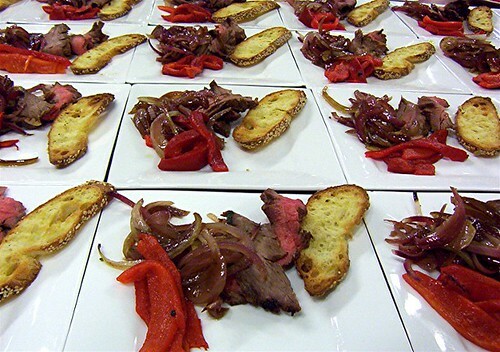 Thirdly, a plate piled with thinly sliced steak, roasted red bell peppers, balsamic onions, a piece of toasted baguette, and (not shown) a good drizzle of gorgonzola sauce. Oh my. Good stuff. And finally! 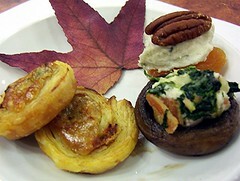 Instead of dessert, a plate of savory nibbles: a mushroom stuffed with cheese, bacon and spinach, puff pastry pinwheels stuffed with pepperoni and mustard, and a dried apricot topped with cheese and a pecan. And of course, the dishwasher broke and we ended up washing something like 120 plates, 30 water glasses and 30 wine glasses mostly by hand. Good thing the food and wine were good! Just vacationed on the coast and fell in love with that central coast BBQ. Went to several restaurants, but went back for a second time to the Hitching Post in Casmalia. Had the best Steak I ever tasted and that wine was delicious. It will be a while before I can get out that way again. They said they deliver their food on line bbq to you…something like that. Do you know anyothers who deliver that great central coast BBQ? Bob, I have no idea what you’re talking about! 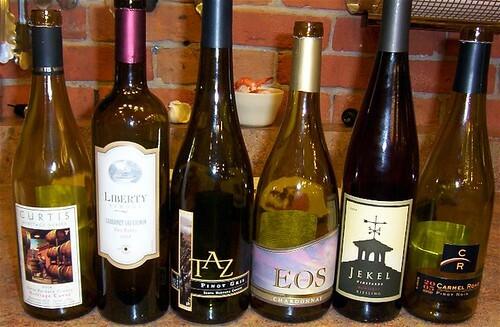 This was just a tasting of wines from the Central Coast area, not a trip there or a BBQ tasting. But I’m happy to hear about good places to eat in case I do get to travel that way someday.